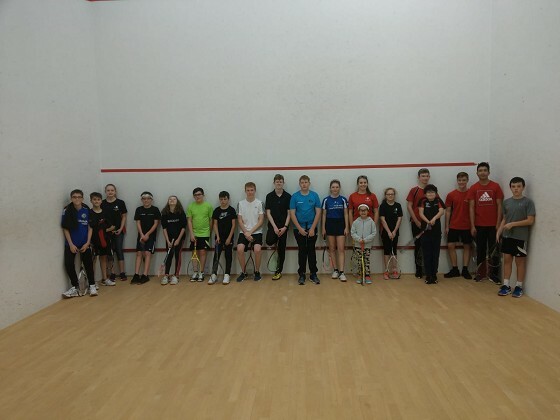 On Saturday 18 of our Juniors took part in the inaugural Northants Junior Squash Teams fixture. There were 6 teams playing across 2 venues, in all 45 children (3 teams of 8 and 3 teams of 7). Matches were best of 5 and the idea is to build up the Junior's experience of the longer format of the game (Grand Prix's tend to be one game per match). It went down a storm both with the Juniors and the parents. The best of 5 format really energising some children with some great closely fought games. 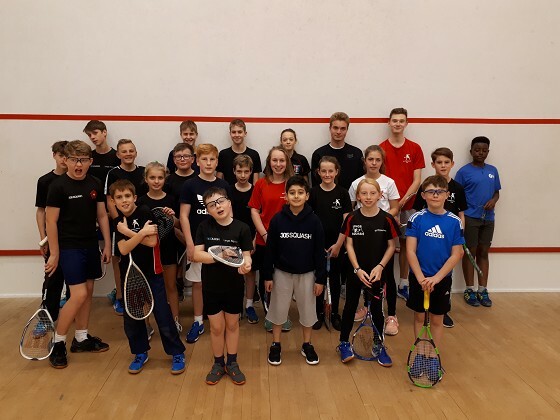 A couple of quotes from parents ' A great day, brilliantly organised ' (well done Mr Broadbent) and ' Caitlin and Thomas were talking about this all the way home....fab afternoon's squash '. As always the matches were played in great spirit and sportsmanship some wins and some losses. Our next stage is to get team t-shirts (this was what we did the fund raising for) and our next fixture will be in January. Well done to Brackly Juniors for their participation and a great afternoon. Junior teams at the Lings venue, we clearly had way more fun looking at this picture.